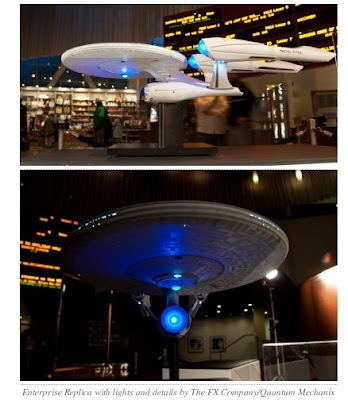 Just in time for the Star Trek trailer premiere with Watchmen, Paramount put up a new Star Trek display at the Hollywood Arclight on Thursday. Visitors to the theater lobby can see three Enterprise ship displays, each encased in glass. All three ships are around three feet long and shaped like the new USS Enterprise from the Star Trek movie. One is painted to be an accurate replica, with both paint detailing and lights. The other two have been stylized by local artists.